The New York State grades 3 -8 testing in math and English Language Arts will begin on April 1st. 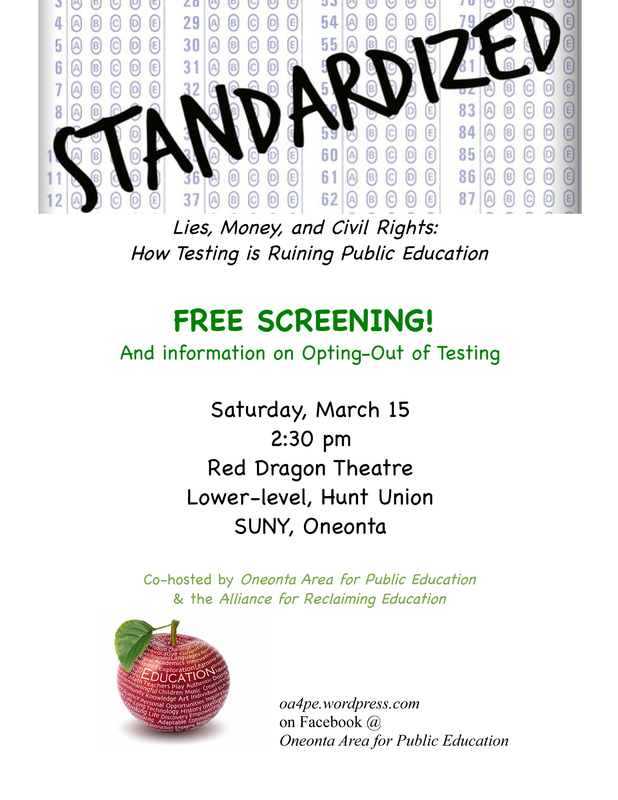 In response to parent concerns regarding this series of standardized testing, the Oneonta Area for Public Education will co-host a film viewing of “Standardized” on March 15 on the SUNY Oneonta campus in the Hunt Union in the Red Dragon Theatre starting at 2:30. This showing is free and open to the public. OAPE members will be on hand to answer questions and open discussion about the film. Materials will be available for those people interested in exploring opting their children out of the state tests through a parent refusal. To find out more about test refusal and to download a refusal letter you can send to your school, visit NYSAPE.org. Oneonta Area for Public Education is just one of many grassroots efforts across the state trying to inform our communities about the dangers of excessive testing and the ill-effects of the Regents Reform Agenda. Join the conversation on Facebook at Oneonta Area for Public Education. You can help us promote this event by downloading flyers at this link and distributing them to members of your community or school district. This entry was posted in Local Events/ Actions, Opt Out, Uncategorized and tagged activism, boycott, film, grades 3-8, NYS tests, opt out, refuse, screening, standardized, testing. Bookmark the permalink. How can I get a screening in my area? You can purchase the dvd or digital download here: http://www.standardizedthefilm.com/ The producers are ok with individuals hosting groups screenings as long as you are not charging admission. My mistake. Here is the correct information about screening the documentary: Any public performance MUST not only be cleared through Rockfish Productions, but incur a $250 licensing fee.